Vilnius greets the starting tourist season with news which will help present the city better and respond to tourists’ needs in a more efficient manner. At the very entry to one of the city’s gates – Vilnius Airport, tourists having just gotten off an airplane will be welcomed by an installation which will make an introduction to cultural projects in Vilnius, whereas the Arrivals Hall will now have a more spacious and comfortable tourist information centre to be operating until 1 o’clock in the morning. According to the data of Vilnius Airport, more than one third (38%) of all passengers arrive from 6 p.m. to 1 a.m. Endeavour is made to make sure that passengers who arrive by late evening flights get all information on the city as well as corresponding services or assistance, if required. For this reason, it was decided that working hours of the new tourist information centre will be different and that the centre will work until the majority of passengers arrive, i.e. until. 1 a.m.
“From now on, passengers, who take late evening flights, will also be provided with the opportunity to visit the tourist information centre and get all information on what to see and do in Vilnius, what events to take part in, how to take public transport and any other important information. It is really delightful that new ideas like this one allow us to consistently develop and improve the range and quality of services provided to travellers at the airport,” Dainius Čiuplys, manager of Vilnius Airport, noted. Vilnius is presented as a city bursting with impressive cultural life just as tourists get off the airplane. 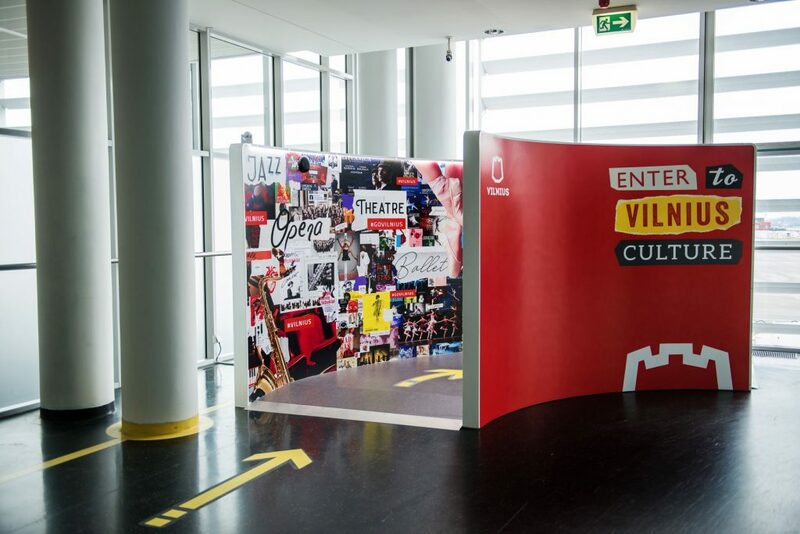 In the corridor from an airplane to the airport, tourists from non-Schengen countries are welcomed by an interactive installation designed by Go Vilnius based on the principle of a collage which introduces Vilnius’ culture through a variety of different types of art ranging from classical ballet and opera to jazz, modern dance and street art. A traveller who makes a step down on the installation hears musical sounds which attract and invite travellers to learn about the city more and to get deeper knowledge of its rich culture. “Airport is one of the key concentration points in which tourist flows are the biggest and where information and advice is demanded most. For this reason, we plan to expand our HR capacity,” Inga Romanovskienė, director of Go Vilnius, said. Tourist information centre in Vilnius Airport has operated since 2011. This spring the centre was moved to a new, more spacious arrivals hall. From now on, this tourist information centre may be entered with luggage, maps are offered as well as any advice. The tourist information centre is open from 9 a.m. to 1 a.m. every day.